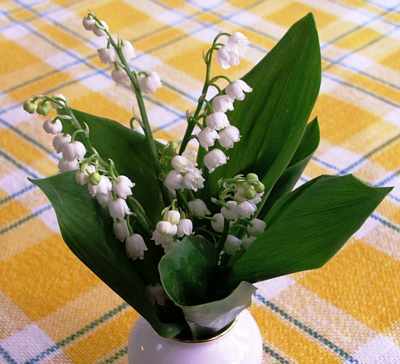 Lily-of-the-Valley Lily of the Valley (Convallaria majalis) is a popular garden plant, grown for its scented flowers. Lily of the Valley (Convallaria majalis) is a popular garden plant, grown for its scented flowers and for its ground-covering abilities in shady locations. 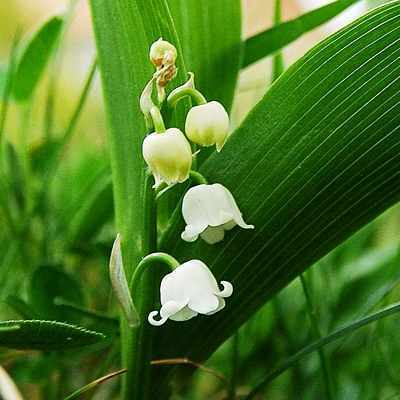 They have clusters of small, white, bell-shaped flowers that hang from a strong reedy stalk. 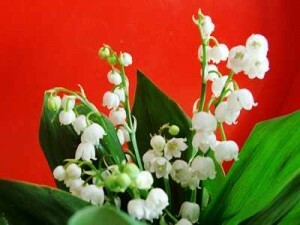 Many people do not realize how easy it is to grow Lily of the Valley indoors. Like paperwhites, Lily of the Valley can be grown in just 3 to 4 weeks indoors for much-needed middle of the winter fragrance, colour, and gardening enjoyment. They do not need any cold treatment or special care – just plant them and enjoy the flowers in a couple of weeks´ time. 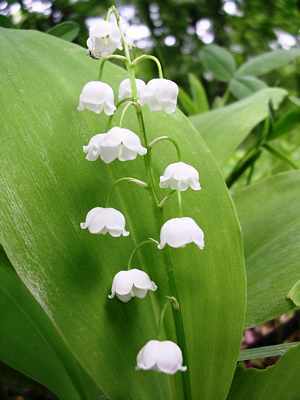 Plus, not only is growing Lily of the Valley indoors rewarding, but you can plant them up in 3-week intervals all winter and enjoy wonderfully fragrant flowers continually throughout the cold months. 1. Lily-of-the-Valley (Convallaria majalis) come as dormant rhizomes also called “pips”. When you purchase them each division should have at least one “pip” – a pinkish-white growing tip that looks like the eye of a potato. 2. Find a container that is at least 3 inches (7.5 cm) or more deep. Add high quality planting medium that will hold moisture well, but dry out a bit in between waterings. 3. Before planting, soak your pips in lukewarm water for a couple of hours. Just take them out of their bag and put them in a bucket or your sink. The pips will absorb water and should swell a bit and become hard. They are now ready to start growing almost immediately. 4. Before planting them up, if your pips have roots, snip off the root tips by about a 1/2 inch (1.25 cm). This will activate the roots, encourage moisture uptake and jump start the growing process. 5. 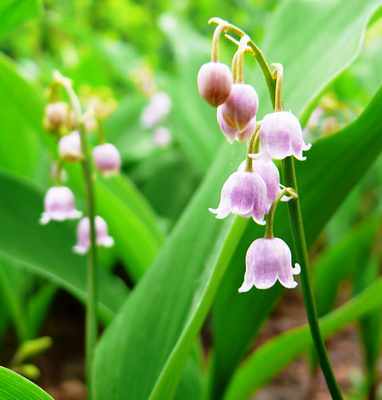 Planting your Lily of the Valley – Cover the roots with mix until just the tips of the pips show, and plant them about 1-1/2 inches (3.75 cm) apart. 6. After planting, water liberally, soaking the soil. The plants will start to push new growth very quickly, usually in just a week. 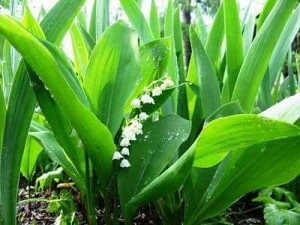 Keep the soil evenly moist since Lily of the Valley grow so rapidly they need water to keep up the fast pace of growth. 7. Place your pot in a cool area, 16° to 18° C is ideal, and make sure it gets lots of indirect sunlight. 8. When the plants flower, feel free to cut them for bouquets; it will not hurt the plants. 9. After the plants have flowered, leave the foliage in place – do not cut it off. If you want, you can transplant the plants to a shady area outdoors when the weather is mild. Lilies of the Valley are easy to grow under most conditions, though they do best in partial shade. Once they are well rooted they will spread indefinitely by means of the underground rhizomes. They are an excellent ground cover that lasts until frost sets in. Their outstanding feature is their sweet fragrance; their scent has even inspired perfumes. There may be a dozen or more blossoms per plant. The best way to appreciate the fragrance is to plant Lilies of the Valley along a walkway or in raised containers which you regularly pass by. Once they are well established, they will form large clumps that need almost no care and live for many years. Garden catalogues and nurseries will either sell a complete potted plant, or a package of pips, from which you can start new plants. Use the second alternative, pips, if possible, as they are much cheaper. All parts of the plant, including the berries, are highly poisonous. If the plant is touched or handled, hands should be washed before doing anything else. Combining notes of sparkling bergamot and green accords leading to white jasmine.